Flipkart will offer Special discounts only on the Flipkart Mobile App from 7th to 9th March 2016 in their Flipkart Big App Shopping Days offer.If you wanted to buy something but you didn’t t means #Achhakiya its right time to buy in Flipkart Big App Shopping Days.After three successful Big App Shopping Days (8-12 December 2014, 23-25 March 2015 and 22nd – 24th June 2015) now Flipkart has come back again with 6th Mega Big App Shopping Days starts from 7th March for 3 days till 9th March 2016. Flipkart going to offer upto 90% off on products.Flipkart has again came up with it’s “BIG APP SHOPPING DAY”. Now get heavy discounts on Mobile, tablets, accessories ,clothes, books,etc on this upcoming event of Flipkart held on 7th to 9th of March, 2016. For more exciting and mind blowing deals, stay connected with Dealsnloot. Happy Shopping. This sale will run for 3 days, as mentioned below. Live from 25th May to 27th May. 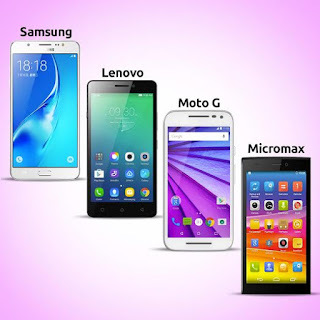 Additional 10% Cashback (upto Rs. 2000) on Rs. 5999+ purchase offer with Citi Bank Debit and Card card from 25th to 27th May Terms and Conditions. Play Snake & Ladders game on Flipkart App and win prizes Offer Source. 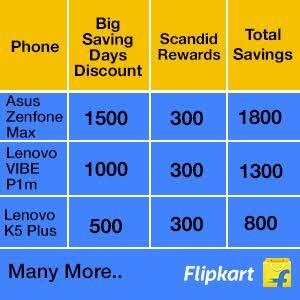 How to get Scandid Reward (Flipkart Gift Card) on smartphone ? Go to Top deals section. Proceed further by doing order there. You will find order history in your Scandid Rewards Section. Note :- You will get assured Mentioned Cashback (Flipkart Gift Voucher) in your scandid app ,after the delivery of your product .